As most readers are probably aware now I have a love for MMO’s. Puzzle Pirates was my first and is one that keeps pulling me back into it. This time the draw back has been the merge of several of the oceans. The two subscription oceans (of which I played on one) have been merged together so there are more people to play together. This has been something people have been asking for for a long time, me included. The game is a little bit of a niche game and isn’t everyone’s cup of tea but it’s very cutesy and fun. It’s about the only game I’ve ever considered coughing up the subscription for to the point where I get a discount on my yearly subscription price for being subscribed for so long. I really do love the game. 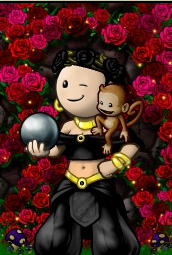 This is my pirates portrait with her recent acquisition – a monkey called Muse. Monkey’s are part of the item’s in game called familiars, there are also octopi, parrots, sea horses (called Ipollito), serpents, skeletal monkeys and ghostlings. They come in all sorts of colours with tan being the cheapest and most common. I recently acquired my first tan monkey, something I’ve been saving for in the game for quite some time. They are quite the status symbol. Anyway back to the game. It’s puzzle based as the name suggests with puzzles for every type of thing you can do, for example on a ship, when you sail it, there are many puzzles activated that need doing by the players aboard. 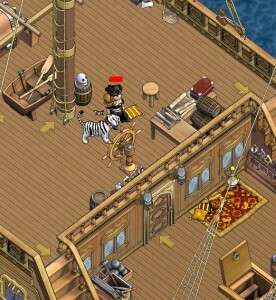 The captain can perform the navigation puzzle which speeds the ship up and increases the chances of getting the required ship to fight if in pillage mode, or avoiding other ships if in evading mode and moving stock. Next is the sailing or rigging puzzles which are done by some crew members and contribute to the speed of the ship out of battles and movement tokens in battle. There is also carpentry which is a tetris piece based game where you fill in holes in wooden planking to repair the ship, bilge which is very similar to the popular game bejeweled and finally the gunnery puzzle, as loading your cannons is very important in ship battles. There are many types of ship from the standard piratey ships to asian and the odd viking ship. Here’s me with one of my pet’s, tari, and muse on one of my newest ship’s the xebec – Creative Spot. It’s a very large ship which can support a max crew of 45 players. The largest ship in the game, the grand frigate, can have up to 150 players on it at once which as you can imagine is quite something to see. On top of all the many different sea adventures people can go on, all shops to make the ships, clothes, swords, shot and rum needed are also made by players and run by them. There are shop duty puzzles that can be performed to decide on whether the labour being provided by each player is expert, skilled, or just basic and each item to make requires a differing amount of each type of labour hours. So the game has lots of different ways to make pieces of eight (the currency) and have fun, from trading, to socialising, to just passing away a few hours puzzling on someone elses ship. There’s even tournaments of puzzles against other players in the inns on each island, including card games and a very nifty little puzzle called treasure drop. I think it’s because of this large number of puzzles in one game and large number of ways to make pieces of eight that keep me coming back. No two log ins have to be played the same way. Here’s the website if you want to check out the game and if you want to see if you can find me I’m on the Cerulean subscription ocean. I have one project that is approaching its finish, and a few that are on the way. The one nearing completion is a fantasy children’s book. The main character is a young witch who gets into all kinds of strange adventures with a few friends. This little witch is the kid sister of my almost famous character Hilda the Wicked Witch, of whom I am working on the 9th book. The last iron in my fire is the 6th story of Lily Marin, my Steampunk heroine. She is a far more intriguing character than Hilda or Charisma. Lily is a singer who has a secret, which made her develop an alter ego that she tries to hide from the people who know her. That, of course, becomes increasingly difficult. How do you find writing in different genres? Do your fans mind and do you make it obvious for them? Producing more than one genre is refreshing. That is the only way I can say it. Sticking to one genre for me is like looking at one thing only, and that is a waste, as I’d be ignoring so many other things. There is a lot out there in the world, each thing with its own beauty, shape and colour. Depending on my mood I prefer one thing to the other. That, by the way, is how I started writing Steampunk, because that has somewhat of a ‘dark’ atmosphere. I was not feeling very cheerful and had the urge to write. That is how for Lily Marin came to be. I don’t think my fans mind the different genres. Some like to read many genres as well, I know of a few who also read genres I don’t write, and that’s of course fine. They also don’t want to look at one thing only. For the people who only like one particular style or genre, there is always the choice to skip the books they don’t care about. When I am writing something that is not the fantasy-world of Hilda the Wicked Witch, I mention that on my website and my Facebook Author page clearly, so people know what to expect. The majority of fans, I know that, are there for the Witch though. It’s unusual for a writer’s main characters to all be the opposite gender, was this a deliberate decision or just what the stories required? For Hilda this was deliberate in a way. Hilda was ‘born’ out of the necessity to quickly have a character which was very versatile. I quickly was clear on using magic, and what better person to wield magic than a witch? I had a view of the character’s attitude, and somehow that did not blend in well with a wizard. Lily came to be after I had read a few Steampunk books where the main characters all mostly male. Of course, the Parasol Protectorate of Gail Carriger being a magnificent exception. For some reason, I think that writing female characters fits me better than male characters, although in Bactine, which is a Steampunk/Scifi crossover, the main character is a man. A soldier. Ouch, that is a hard question. There are so many wonderful books. I think that would be Jack Vance’s scifi fantasy series about Tschai the mad planet. This has to be fantasy. Steampunk and SciFi are great and interesting, but fantasy is boundless. For reading, it’s perhaps even harder, as more than one genre have amazing books. Steampunk, fantasy, paranormal, SciFi, they all have their own attraction. I like the diversity in reading, which may be the reason why there is diversity in my writing as well. I have a full-time job as an IT consultant, so writing comes – uhm -… No, let’s be honest. Writing comes first, despite the job. If I could support myself through writing, that would be great. So far, I give away most of the books I have written. Only the lastest book of Hilda the Witch (part 8), and a big Steampunk/SciFi story called Bactine are actually for sale. I cannot see me sit idle, without writing. There are too many stories and ideas inside my head. If I don’t let them out through writing, I think I’d go bonkers. In juggling both a day job and writing do you have any tips for others doing the same? First thing would be to be smart with the time you have, although that might be an open door. For me, writing is a creative thing that does not stop when I leave my writing software. I keep thinking about it most of the day (and night even), so I always have something with me to record thoughts, ideas, and things to research. At work that’s a simple little notepad, and in the car I have a voice recorder app on my phone. It’s quick and easy to use, so ideas don’t get lost. Something else that’s important to me is to get out and away from everything regularly. Don’t live a life that’s only work and writing, because then life escapes while you’re busy doing other things. The best places to describe are the ones you’ve seen, smelled and felt. The best forests I have written about are the ones I walked in, as an example. Keep your eyes, nose and ears open. Pick up everything that’s there, take home a fallen leaf if you want and can. Everything can help to detail a situation better. Pay attention to people, even when you’re waiting in line to pay your groceries. Watch the rain fall, and go outside in it to experience it. You can’t convey what it is to be cold if you’ve never been cold. And I already have plans for a new children’s book, but that’s something for the further away future. If people want to learn more about Paul Kater and the books he has written so far, they can go to his website, where he has a separate page dedicated to the books he has published so far, and have a look (or like) at his Facebook author page or on Google+. Anya had read through the prophecy once already but found it made little sense to her. After giving herself a moments rest she looked over it again. When the lion, beaked by an owl, rises from the dead remains of an old nest a leader will come to the faithful. His wisdom will see through all veils and be the final judge. People will perish without his guidance. With him, enlightenment will be gained and gifts of devotion bestowed. He will lead his people to a better world as they prepare for the end times. The end will be known when many signs have been seen and plans made. It will come like a great flying eagle, reaching great speed as its destination approaches. The first sign of the coming end will be the rising up of the gifted people. They will flock to the leaser as bees to nectar. He will teach them and lead them in the ways of the Ox. Every member will become like the great roots of a tree. Spreading upwards and outwards they will sap everything they need to feed the tree growing beneath the surface. When the three spoons of prosperity are gathered together with the plough, a badgers set will be made. It will grow and form until it can no longer be contained within it’s shell. It shall keep its desires secret but parade it’s existence to all, growing fat from the ignorance of the weak. Then comes the great shedding. The badger will detach itself from the world around and shed it’s skin to reveal the gyroscope underneath. Only the worthy will be able to cross the void between the untouched and the enlightened. The world will react with fear at first until the men with the silver sceptre extend their pledges of allegiance. One by one each oppressor will fall and be judged until all of the evil is separated and made known. Utopia shall blossom, fed by the submission of the unworthy until all of the righteous and unburdened can rejoice together. Even after a second run through it confused her, but what she could make of it she knew to be wrong. It implied a world’s end would be replaced with some kind of utopia built on slaves of the unsaved. She knew this could not be true as the Bible said otherwise. Anya picked up her Bible and flicked to Revelation, skim reading through it. It definitely didn’t agree with the prophecy. She then read through the prophecy several more times. She needed to tell her pastors what it said and she knew Sherdan would never let her take it from him. There was no other choice but to memorise it. When she was happy that she would remember it she would leave and tell her pastors. It hadn’t escaped her notice that Sherdan had told her she would never leave, but God had got her in here and He could get her out again. Even if she had no idea how yet. She then prayed. She wished for God’s guidance on her next move. Sherdan had changed since she first met him and she knew her actions were partly responsible. God would have the last say in what she did but she wanted to leave on good terms with Sherdan if she could, and sneaking out of his facility would not be conducive to a lasting friendship. Anya was still praying when Sherdan came back. He apologised when he noticed her kneeling on the floor. She went to get up but found her legs had gone stiff. He helped her move to sit on the edge of the bed. “Do you often pray on your knees?” he asked. She shook her head. “It is snowing,” Sherdan told her. She suspected he had deliberately changed the subject but she didn’t mind. Snow was one of her favourite things. She hobbled over to the window. “To be completely honest I don’t mind if it does. If any of it does,” she motioned to her wrists as she watched the snow fall and settle outside. “I assume you’ve read it.” She nodded. “And?” He looked hopefully at her. “I thought you probably did.” Anya rolled her eyes. “It doesn’t really matter what I think. I shall inform my pastor’s and let them decide. I would like to leave now please.” She stepped away from the windows and towards Sherdan. He scowled. Sherdan came back around from the other side of the bed, shaking his head as he did. “I don’t belong to you and don’t think you can keep me trapped in a normal house for long.” Sherdan laughed but Anya didn’t find it entirely unexpected. Sherdan stormed out of her room before she could reply. She soon heard the familiar click of the lock. Tears slid down her cheeks at his outburst. She wasn’t really upset that he was trying to keep her prisoner. She knew that wouldn’t stop God. She was upset because she had wanted to leave as Sherdan’s friend. He had made it perfectly clear how angry he would be at her if she escaped against his will. She had to try, however. God’s last command to her had been clear: get the prophecy and bring it home. Anya had enough sense to sit, calm herself and pray for God’s blessing before attempting any kind of escape plan. She knew her door was locked and Sherdan would hear her attempting to break it down so she considered picking the lock. There wasn’t anything particularly useful to use as a pick, except possibly cutlery from the dinner Sherdan had brought her. It had been forgotten thanks to the argument. She added lock-picking to the potential list and went to the window. All the windows were locked so no window exit could be quiet. She also noted that she was two floors up from street level and there wasn’t any way down but to jump. She’d be lucky not to break something without God’s protection. Her only sensible option was to try lock picking unless God explicitly told her otherwise. She picked up the knife from the food tray and went to the door. She soon found that it was far too large for the keyhole and swapped it for the fork. The fork wasn’t much better and Anya was soon kneeling in the middle of the floor begging God for his assistance. Half an hour later Anya sank into a heap of frustrated tears. She knew God had heard her but if He’d answered she couldn’t hear it. She didn’t want to be here any longer. Her heart ached to be home in Bath, with people that cared for her, where she felt safe and loved. Anya soon got up off the floor and got into bed. She was tired and knew she always felt more emotional when tired. She would sleep and try again in the morning. Disclaimer: The above prophecy is a complete work of fiction. I do not expect a single word of it to come true as I made most of it up to fit a random plot idea and then friends challenged me with random items or things to some how include. Please do not start any cults, religious organisations or anything equally group like based on the above idea of how the world might end. I was not divinly inspired. I was lent this film by my fellow blogger Chrysalis who also reviewed the film. I read his review before reading and it intrigued me enough to try watching the film as well. It’s a very sad film and one I wouldn’t normally consider watching for that reason. I think life is sad enough without dwelling on sad things. However, sometimes sad things can remind us of the good things we have and for me that’s what this film did. It showed what it felt like to know life would be short and how important it was to make the most of each day. I came away wanting to seek each of the people I cared about and let them know I cared. It was just a shame I was sick at the time and couldn’t see many of them. The directorship and the acting were perfect. Kiera Knightly did a better job than I think I’ve ever seen her do. There was a particularly good moment between the other two main characters that had me moved to tears and was amazingly well acted. I felt sad but at the same time relieved that the circumstances in the film were, thankfully, not happening in real life. It was very much a warning that the film conveyed that we can’t forget our humanity and become too selfish. Life is about so much more. I have to admit I’m not sure quite how I managed this but I find myself over a year into my blogging and still going strong. I love the scheduling feature wordpress has and I have grown my readership an alarming amount with keeping consistent and blogging in themes. There does probably need to be some kind of structure I’ve found. At least some kind of theme where readers have a little bit of an idea what to expect. If I dotted around all sorts of subjects I think it would put people off but at the same time I do sometimes throw a really random and different blog into the mix. My blogging has definitely evolved over the last year. When I first started blogging I was set on it being part reviews part how-to’s and part things I’m interested in and distracted by. Since then I’ve also started sharing things with my readers that I’ve been working on. In some cases finished things and in other cases just photo’s of something I’m part way through. I still don’t have the hugest number of people commenting but if my hit numbers per month are to be rellied upon I’m doing very well in terms of regular readers and quite a few of you are lurking in the back ground, especially rss feed readers. The best thing about blogging every three days for a year has been the discipline I’ve been taught. Almost without fail I sit down on Monday’s, Wednesdays, and Fridays and write a blog to schedule up. The only time I don’t do this is when sick or on holiday which usually means I’m about a month ahead with writing blogs and covered against emergency breaks. It even meant that I could do NaNoWriMo last year and not need to write any blogs while still having it appear as if I’d been writing them. There have been times I’ve struggled to think of subjects to blog about, especially with my how-to section but I think it’s been good for me to figure out what I’ve learnt and how I’m learning it over the last year. I’ve come a lot further than I realised I had when I look back on all the how-to articles. Here’s to hoping the blog continues for many years to come, but since we’re a year in and it seems a good time to play with the format of things, what would you all like to see more of or less of? Just more blogs in general or possibly even something I’ve not thought of doing? I have only released one book so far. The title is Always There. It’s a drama about a group of friends and their journey through a series of events that could change their lives forever. My greatest inspiration has been my son. I love to write and don’t feel as though I need much inspiration to get me started. I definitely don’t write for financial reasons. I write because I enjoy it. Yes it would be lovely to make millions like some authors have, but I know only a few have achieved it. I wouldn’t know what to do with myself if I didn’t write. I think I’d be lost! Writing is obviously an important past time for you, when did you first know you wanted to be a writer? I was fourteen when I first realised I wanted to be a writer but it remained a hobby for a long time. It was only a couple of years ago I decided I had to start taking my passion for writing more seriously. My perfect writing day is having an empty house so I can get carried away and not have to worry about what is going on around me. I like to get involved with my plots and characters and find it easier if I don’t have any interruptions. You like to have an empty house, do you need it to be quiet then or just no distractions to write? I like to have music playing in the background and definitely no other distractions. Do you find the character’s, the plot or single scenes come to you first when you get a new idea? I tend to start with a single scene and work around it building the plot and characters. I am currently working on my next book, A Time To Let Go, which is another drama. I am hoping to have a go at writing in a different genre after this next drama. I don’t want to give too much away, but I do have some ideas! I know all my avid readers are expecting Sherdan’s Prophecy Chapter 10 in this slot on my blogging schedule but I’ve decided to delibrately interupt to tell you something more important. I’m making you wait because I’d like you all to do something for me. This video is amazing and seriously important and I felt it was my duty to do my bit so I’ve decided to sue the attention I had to help make Joseph Kony famous, not to celebrate him, but to raise support for his arrest and set a precedent for international justice. It does seem to be possible to get the support kits in the UK from their website here and I plan on getting one and getting together a team pasting the posters all over cities world wide on April 20th. If people who want to join us and help get posters enough to do so want to contact me then please comment below (it will give me but no one else your email address so I can get in contact with you). Thank you all for reading this instead of the chapter you were expecting. I’ve been watching a lot of Sharpe films lately and I’ve been very struck with the structure of the army and all the rules they have. I found myself realising that the way the British army works is actually pretty similar to the way God’s army works or God’s church if you want it in plain terms. It says very clearly in Ephesians 6 that we’re a group of people fighting spiritual forces for God. There’s a battle and we’re in it. Wouldn’t it help a lot if we knew the rules? If we knew how our own army needed to work to function best? To start with everyone knew they were being paid. Well in God’s case our promise was a reward in heaven, while this isn’t much like your army today (they get paid monthly like the rest of us) the older armies used to go several months without getting paid and would often have to wait until the war was over and they got home to get their rewards, medals and pay. (Much like Christians waiting until Heaven to get their reward). You’re going to do things now and wonder if it’s been recognised and you are going to have to wait until the war is over before you will get all the recognition for your hard work. There’s no point moaning that you’ve done lots of hard work and it’s gone unnoticed. God noticed and He’ll be the one making sure you get any pay left over that’s owing to you when you get to heaven. Do you want your reward now or do you want it in heaven? Secondly being in the army means you have tasks to do. These tasks are whatever you’re skilled at that helps the army plus whatever the army needs someone to do, regardless of skill. There are times when your talents are meant to be used to serve the church and there are times when the church will ask you to do something you like less or are less good at. Do it anyway because you’re helping make God’s army work. That means we have to do crappy tasks sometimes as well as the things we love. I don’t know many people who would consider themselves talented at cleaning loos or making sandwiches but an armies got to eat, stay clean and be healthy to fight effectively. When the heat of the battle comes we want a fighting fit army. Do you want to sneak out of cleaning duty or win that major battle and the glory that goes with it? There are rules you have to obey. In slightly older army times if you were caught stealing, plundering or anything else like that (basically anything naughty) while in the army, you were sentenced to death. If you ran away from a battle and the squad you were called to fight in, you were sentenced to death. If you were caught asleep while on guard duty, you were sentenced to death. And if you disobeyed a direct order, you guessed it, you were sentenced to death. These days you wouldn’t be sentenced to death for any of these but they would lead to what we’d call a court martial, the expulsion from the army and potential other punishments like prison time. Being kicked out of God’s army is to be spiritually dead. So if we sin and let our spirits go to sleep we run the risk of spiritually dying. Thankfully there is forgiveness but it’s always better to not do the wrong thing in the first place and to keep our spirits awake to the dangers around us. Do you want those weeks of comfortable easy going church life where no one asks you to do anything you don’t want to or do you want to live? Finally the army has ranks. There’s nothing democratic about it. If you’re given an order from someone of a higher rank than you then you were expected to obey it, that instant, without question. In God’s army there are also ranks. Each church has a leader or two who sit at the top of that church’s part of the army. Sometimes they have people above them too if part of a movement but not always, and God sits above everyone. That Church leader is your main commanding officer. They get all the information. They usually have a team around them who help them gather the information they need, people who specialise in particular important aspects of decision making, information gathering and organisation. The team below the leaders often give out orders too and report to the commanding officer, they’re often the ones that hear complaints as well. Below that there are often smaller groups led by officers and within those smaller groups small companies of people led by another officer or two (much like the small group structure in church). These companies/groups/regiments did as they were told by their officers, who got their orders from the team or commanding officer, usually in separate meetings where information was passed down that isn’t passed to everyone below. The soldiers in the groups were expected to obey because they didn’t have all the information. Informing everyone of everything is an impossible task and often takes too long. In battle there isn’t time so orders need to be obeyed and it’s far too easy to think a decision or order is wrong without all the facts and experience of leading an army. If orders weren’t obeyed battles were lost or more people were wounded or killed in the mayhem that ensued. The enemy doesn’t stop attacking just because you’ve decided not to follow an order, if anything you’re attacked more because you’re out on your own or a small group and an easy target. If the order was wrong then it was the officer who gave it who was punished not the people who obeyed it. Do you want to act entirely on your own decision making or do you want to fall in line and help keep yourself and those around you safe during the battles? If God’s church is God’s army then it’s our responsibility to make sure we act like soldiers who know who their superiors are and get on with the tasks given them by any of the officers above them, including God. Not to question and dither and fuss because we’re not 100% comfortable or happy with the orders being given. I recently read the phantom of the opera in it’s original book format. It wasn’t what I expected. From the people I’d spoken to who also read it they said the phantom was painted in a much less favourable light than the opera piece but I actually disagree. I came from the book feeling just as much pity for the phantom as I did the opera. He wasn’t quite the same, a little less dashing and much more disfigured but still the same power of voice, presence and unashamed devotion to Christine. He really does love her like he’s never loved anything before and wants her to be happy and be with him. That’s all he actually wants, a relatively normal standard life and somebody to share it with and for most of the book he thinks he’s found that in Christine. It’s actually really rather sweet and for the most part he does less harm in the book than the opera. He has done harm in the past but more on the request of others than actually by his own choices. Christine was actually my least favourite in the book. She really didn’t help herself and unlike in the opera where she seems genuinly to pity and feel for him here she was just scared by how ugly he was and did everything she could to get away even pretending to love him when she didn’t. I know it was more normal back then to be scared of things that were ugly and shun them but I lost all pity I felt for Christine normally by the way she handled her fear. Raoul grew on me but still seemed a little bit of a whinny brat. He does at least believe Christine in this version though and does his best to help her. I did feel his love was a lot more genuine even if immaturely bourne. Over all I’d say it was on parr with the opera but heavy to read in the older english style. I really really think freedom is important. As a lot of people are already well aware I’m quite vocal about my dislike of the trafficking rise lately and the twenty seven million people who are slaves in the world at the moment. Today I’d like to talk about another form of freedom; Freedom of Speech. I actually believe that freedom of speech and openness in opinions is important in any world trying not to be corrupt. I also think as a creative person that freedom of speech is important. If our ability to speak out against things is hampered then so is our art and that can begin the descent of a very slippery slope in which just for creating the wrong thing someone can be jailed. Creating is important to creative people, we often feel like our lives wouldn’t be worth living if we couldn’t create and if we are bounded by other people’s opinions of what we should create about we’re stifled and stopped from creating. I feel that this relates to things like Wikileaks. Wikileaks have spent the last few years exposing corruption in corporations and governments and anything else they get handed. They’ve said what a lot of people have expected all along and proved it. They are being brave and speaking out against people doing bad things. This should be a good thing and I think artistic people should be doing it too. The problem has arisen in the response of the corrupt people. They’ve done everything they can to slander and ruin the people brave enough to speak out. The recent release from wikileaks is the start of 5.5 million emails from the private investigation company Stratfor and it’s customers, in a lot of cases US government officials or investigation bureaus. “I think it’s very difficult to indict him on anything though. This email is between what appears to be a group of people including Stratfor representatives, Fred Burton who is considered an expert on terrorism and security against them and possibly the FBI. The email discusses all sort of ways they might be able to get Assange arrested directly and remove him from the public sphere. There is also another set of emails written by Fred Burton, and others within Stratfor, full of vitriole and hatred towards Assange saying about ruining him before he’s arrested. Also they want to have him extradited to the US, where a secret Jury now meets, with no defense lawyers for Assange, working out whether he should be convicted for anything. Basically looking at the emails currently released that mention Assange or Bradley Manning these Americans think that they’re taking down an egotistical maniac that has dared to threaten their country and everyone connected to him, in the hopes that they’ll be cutting the head off the hydra and it won’t grow more. Simply put I don’t think we should stand for this. It affects anyone who wants to expose corruption and stand up for what they believe in! The US government is reacting badly to something they should be apologising for. The shouldn’t be trying to ruin the people who dared to question the use of their authority. So in light of that I’ll stand by the wikileaks folks and be counted. Assange may be at the top but a lot of people think their work is important, me included. You can also sign up to the website here to become a friend of wikileaks and help band with them.